The capital district voice; Albany's Reggae King! Listen to my radio show every Saturday from 12:00 - 4:00 on WCDB SUNY Albany, NY. Listen online worldwide! Hi, I'm Sir Walford, promoter of various types of music and a Disc Jockey based in Albany, New York. I have been doing my own radio show for approximately 27 years and started through Rensselaer Polytechnic Institute in, Troy, New York. While doing my radio show at RPI, I presented a wide variety of Reggae music and was instrumental in providing Reggae music to the capital district. I was the first to promote Reggae music in the capital district and the first to provide Reggae on a commercial radio station in the capital district. 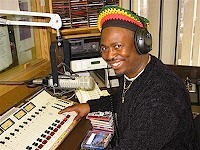 For a couple of years, I did a commercial radio show in the Albany, NY area which catered mainly to Reggae music. I currently do a radio show called "The other side of Sir Walford" which provides a wide variety of music ranging from Reggae, Latin, Jazz, Gospel, R& B, Swing, and Oldies among others. Music has been a part of my life as far back as I can remember. I provide my Disc Jockey services for wedding receptions, parties, etc. Over the years, I have played music for guests of the City of Albany, Senators and Legislators, The Black and Puerto-Rican Caucus and for Hillary Clinton when she made an appearance at the Crown Plaza Hotel in Albany, NY in the year 2000. I have performed at many outdoor festivals including The Black Arts Festival in Albany, Vermont Reggae Fest, and festivals at Woodbury, CT and Woodstock, NY. I have also performed with many musical legends, including opening as a DJ for the Clash at RPI in the early 80's. The fact that I play many types of music has brought me global respect from many people who listen to and tape my show. I love working with young people and teaching them how to appreciate music and use it to enhance their lives. Another accomplishment I am proud of is when I chaperoned Rita Marley during her appearance in Albany, NY in the 90's. It was my pleasure to show her around. Please contact me for more information regarding my DJ services.